The following comments about attractions in Bar Harbor have been posted from individuals. We believe that the best reviews of Bar Harbor, Maine (ME), ME USA are written by travelers and holiday makers who have experienced Bar Harbor first hand and want to share their thoughts. Can you share yours? 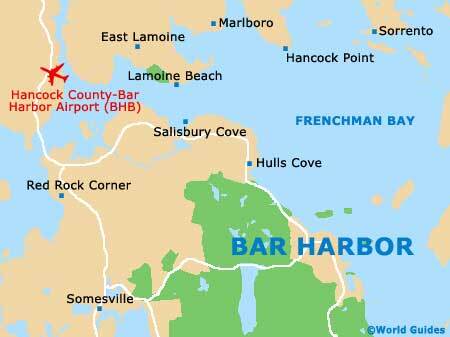 Please help us expand this section of our Bar Harbor World Guide. Let us know what you think about the attractions in Bar Harbor, Maine (ME) USA. Submit comments about Bar Harbor attractions here. Bar Harbor is surprisingly cool in the evenings, so take a coat out with you at night. There are plenty of places to just walk around and window shop or go into for a drink and dinner. You won't meet too many people here of you're on your own - mostly couples and families. We wanted to stay there, but was worried it would be too expensive. Looks beautiful though. I stayed at the Harborside Hotel. I was very lucky because all of he rooms had a harbor view and it was very nice. They also have the tennis courts and swimming pool. I was in town for a more than a week so the exercise facilities were useful. The biking and kayaking are very good! Very rustic, but the perfect place for a quiet stay for two. It is remote, but close to the water area and mountains to go biking or walking. We thought the people working there were very nice. They always try to make sure we have everything. There is a nice food place just off the highway. We had to rent the car to get there - cannot walk from the hotel. It was Mother's Kitchen - very American food and the pies are the best! We also liked Portside Grill at night when we want seafood and good atmosphere for to be social.